The treatment of acute kidney injury (AKI) prior to institution of renal replacement therapy (RRT) has traditionally focused on the management of life-threatening metabolic abnormalities in advanced kidney failure. However, an increased awareness of AKI and a systematic approach to its diagnosis to earlier stages has shifted emphasis to the management of milder AKI, often arising as a complication of other systemic insults such as sepsis or following major surgery. Importantly, while most of these patients never need RRT, they are at significantly increased risk of death. In this context AKI is best understood as an indicator of early organ dysfunction in the deteriorating patient. 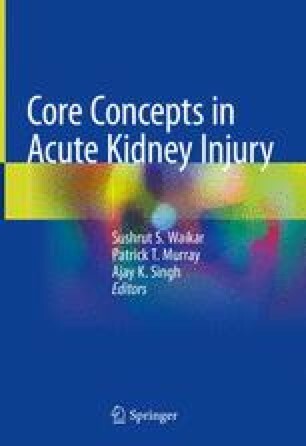 As a consequence, the clinical approach to AKI requires consideration and treatment of underlying causes of AKI such as unrecognized sepsis together with haemodynamic resuscitation aimed at preserving tissue perfusion, an enhanced level of monitoring for further deterioration and avoidance of secondary organ injury by minimization of nephrotoxin exposure and avoidance of other complications. Fluid therapy and vasopressor are the cornerstones of resuscitative therapies in these patients; however overzealous fluid resuscitation risks fluid overload which has been consistently associated with adverse outcomes in the critically ill and particularly in individuals with AKI. Thus after the initial few hours of emergency resuscitation, continued fluid therapy needs to be continuously re-evaluated against a physiological need (evidence of low cardiac output and evidence of fluid responsiveness). Conversely, vasopressor therapy in hyperdynamic shock can improve renal perfusion and function with higher blood pressure targets potentially justified in patients with pre-existing chronic hypertension. Treatment of acute hyperkalaemia in adults. http://www.renal.org/docs/default-source/guidelines-resources/joint-guidelines/treatment-of-acute-hyperkalaemia-in-adults/hyperkalaemia-guideline—march-2014.pdf?sfvrsn=2.